An elaborate border of intertwining flowers and hearts surrounds a heart felt message. The design is stitched on a slightly darker fabric with only white thread. We have used pretty beads as the center of the flowers. 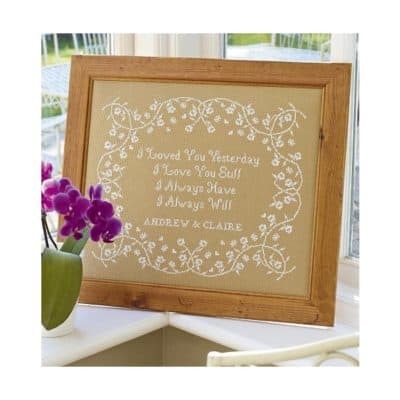 The design has a very delicate lacy appearance and would be suitable for either a wedding or anniversary. This design is available as either a full kit with aida or just as a chart pack for you to source your own materials.